Tuesday, March 26, 2018 - A South African pilot based in Botswana has shocked the world after he deliberately crashed a stolen plane into a building in an attempt to kill his wife after a quarrel. The pilot identified as Charl Viljoen, 38, died in the crash but his wife managed to escape after a friend who was aware of the evil plan alerted her and other guests to leave the house before the crash. Apparently, the pilot had called a friend from the air and asked if his wife was still in the building where a party was going on. 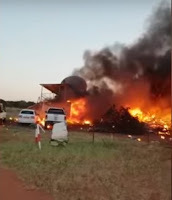 The footage of the incident shows the plane flying dangerously low before it smashed into the building and erupted into flames killing the pilot and destroying the building and 13 parked vehicles. Witnesses reveal that the pilot, who worked for Kalahari Air Services, in Bostwana, was at the party before he was ejected after he assaulted his wife. He left the party by car and went to Sir Seretse Khama International Airport, where Kalahari Air Services is based and ‘stole’ the plane used in the crash.